Phew. The last 2 weeks has been a bit crazy. We are trying to move the blog to wordpress from blogger and the issues just keep piling up. Thankfully I am not doing the transfer, or I would have had a head of gray hair already 🙂 with all the issues of maintaining the urls, images, posts, feed. It is difficult to let someone else do it. For me, its either I do the entire thing, or not do any little bit, else I get sucked into fixing things on my own. Which is not an option right now. So I am trying to get back to the regular blog posting schedule (I have too many drafts! )and also focusing on the cookbook and most likely bugging hubbs to figure out some of the issues with the transfer this weekend. 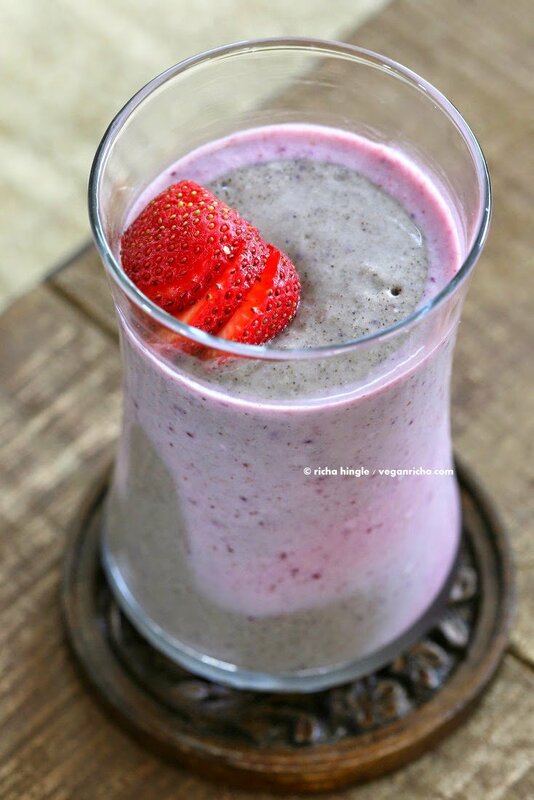 Here is a quick and simple Strawberry Hemp Protein Smoothie. 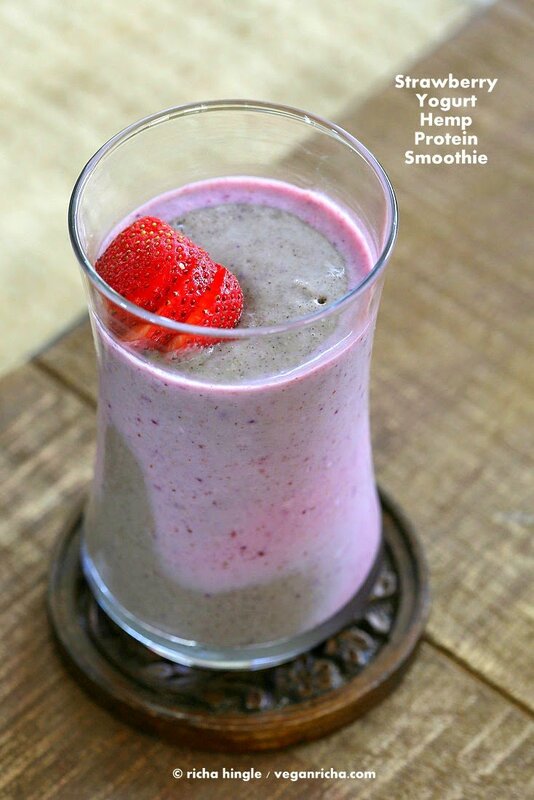 This is a basic smoothie which you can change up to taste and add other things. Change this to a smoothie bowl topped with granola, strawberries, nuts or seeds and a dollop of peanut butter. I used So Delicious plain Almond Milk Yogurt. So Delicious now has plain (not greek) cultured Almond Milk yogurts too and they are all carrageenan free. There are a lot of other flavors as well and they all taste fabulous! The biggest problem I had with plain unflavored non dairy coconut milk yogurt was the taste. It tasted coconutty, was a bit too thick and had some after taste from the additives. The soy milk versions from other brands I tried also had a lot of soy after taste. Now the almond milk version is much fresher, not thickened too much and tastes great when eaten as is. Yes, even the plain ones. I used to love eating fresh plain yogurt between meals and these new yogurts by So Delicious solve that problem! In a blender, add all the ingredients except protein powder. Blend until smooth. 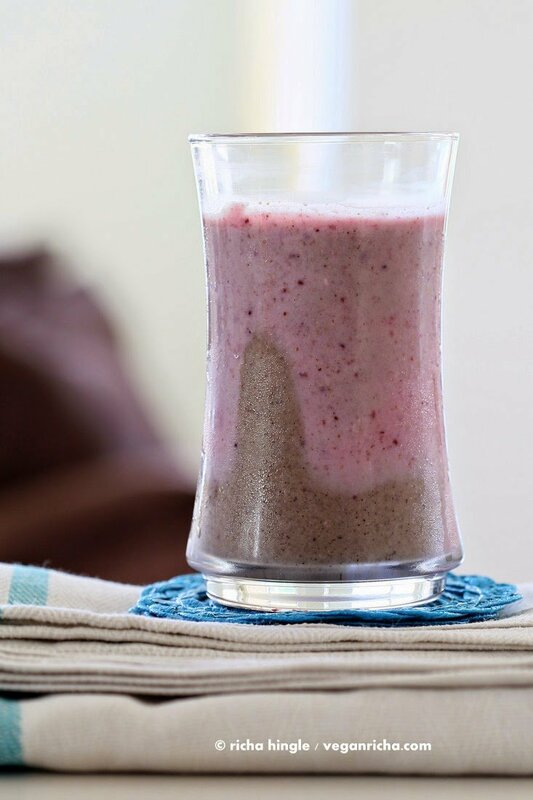 Pour half the smoothie into a glass. Add the protein powder and blend well. Pour the protein smoothie slowly into the glass. Swirl with a spoon if you like or serve as is. use blueberries, mango, banana or other fruits. Omit the non dairy milk and serve the thicker smoothie as a bowl, topped with fresh strawberries, a scoop of nut or seed butter and granola of choice. « Hot Cocoa Snickerdoodles from Decadent Gluten-free Vegan Baking Book. Review. I recently tried So Delicious almond milk yogurt as well, and I was impressed. The only other plain almond milk yogurt I’d ever had was REALLY gross! I couldn’t believe they even bothered making it! It blended well for smoothies, but by itself, it was really bad. Personally, I really like Nancy’s plain soy yogurt. Plus, it’s the only non-dairy yogurt I can find in big tubs around here! This smoothie looks delicious. I have yet to dive into the world of protein powders, but I have had them before and I don’t mind the chalkiness. I can’t wait to try the almond yogurts and am hoping to see them in Northern Ontario soon! I hope the rest of your blog transfer goes smoothly – this is something I feel like I may need to do soon too and now I’m even more anxious about the whole thing! OMG! I love this recipe. I even bought a yoghurt maker just so I can save a little money lol! I even had to tune it down a little as I was drinking yoghurt smoothies everyday!